Warmer weather, longer days, and endless adventures—sounds like the beginning of summer! And the best part about this beautiful month? June is also Great Outdoors Month! You already know that Girl Scouts loves the outdoors. Whether we’re protecting the environment or just having fun, getting outside is one of our favorite things to do. Plus, it’s good for us! In fact, girls who participate in outdoor activities on a monthly basis are stronger challenge-seekers and problem-solvers, which benefits their futures and the world. 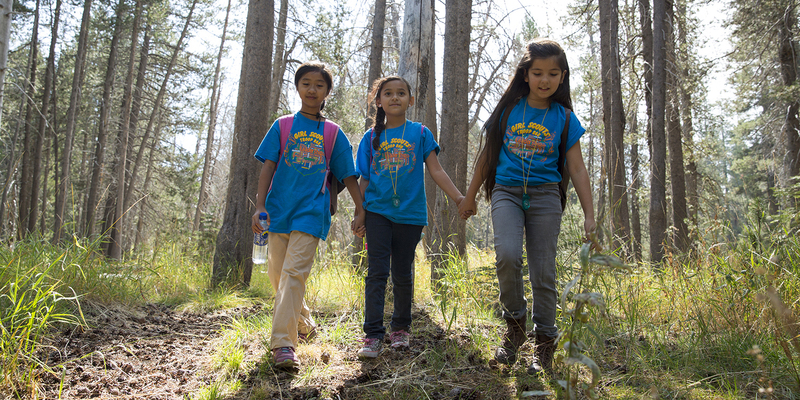 To kick off Great Outdoors Month, we put together our favorite outside activities that you can do to celebrate—like a Girl Scout! 1. Earn your Troop Camping badge. You voted for it, now you can earn it. Starting June 15, the requirements for the 2017 Girls’ Choice badge will be available for download in the Girl Scout Shop! The winning badge for 2017 is Troop Camping, which will be available for all Girl Scout levels—yes, even Daisies! Can’t wait until June 15? Try last year’s winning Art in the Outdoors badges. 2. Earn your Junior Ranger patch. Through Girl Scouts’ continued partnership with the National Park Service, we’ve made it easier than ever to visit your favorite national parks. Girl Scouts have the unique opportunity to complete Journeys, achieve Take Action or Highest Award projects, and even earn a patch along the way! Hey, families with fourth-graders! Through National Park Service’s Every Kid in a Park program, fourth-graders and their families get free (yes, FREE!) access to national parks for an entire year. Find your park today! 3. Go camping. What’s a Girl Scout summer without camp? Making new friends, learning new skills, and overcoming challenges—plus, girls say camping is their most memorable outdoor experience in Girl Scouts. What’s not to love? Many camps are still accepting reservations, so find a Girl Scout camp near you today! To help you and your girl prepare for her camping adventure, we’ve come up with some awesome summer camp hacks to stay light on hassle and big on fun. And don’t forget to freshen up on those favorite camp songs! 4. Care for the environment. It’s easy to be green, especially when you’re a Girl Scout! From the very beginning of Girl Scouting, caring for our world has been part of our DNA. Whether you’re learning about endangered species, planting trees in your local park, or taking the lead to recycle, girls develop a lasting commitment to the environment. It’s your planet—love it! 5. Have fun in your own backyard. Getting outside doesn’t have to be hard; you can explore the wonders of Mother Nature in your own neighborhood! Plant a garden, create a nature scavenger hunt, go for a walk, or have fun in your community park—the options are endless! Whether you’re a nature pro or just starting out, you can help girls of all ages have a positive experience in the great outdoors. Check out these videos and other resources to make getting outdoors even more rewarding for both girls and adults, and get outside!